What’s the best way to run for weight loss? Answering this question is trickier than you might think. The number of calories you burn through running is determined by how many miles you run. So it would stand to reason that the most effective way to slim down through running is to run a lot. 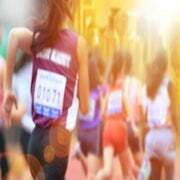 However, when you run a lot your body also wants to eat a lot in order to avoid chronic fatigue or injury. . . and eating a lot is not conducive to weight loss. In fact, while running may be a great weight-loss activity, it’s not the best overall method. Research has proven the most effective tool for shedding pounds is calorie restriction— that is, eating less. When you’re trying to lose weight you should aim to consume 300 to 500 fewer calories per day than your body uses. If you do this, you will lose weight steadily at a moderate rate—but you will also lack the energy to maintain a heavy running schedule. Your body burns fat best when you run at a speed that corresponds to approximately 65 percent of your maximum heart rate. If you’re going by feel, this translates to a five out of 10 on the effort-level scale (10 being an all-out effort). The longer these runs last, the higher the rate of fat burning climbs, so push the duration instead of the pace in these workouts. Avoid taking sports drinks or energy gels during fat-burning runs because their carbohydrate content reduces the muscles’ reliance on body fat for fuel. Fast running is an excellent tool for weight loss. Not only do you torch the most calories when you sprint, but your body also burns more fat for a longer period of time afterward. Uphill sprinting gets your heart rate soaring, and it’s easier on your joints and muscles than sprinting on flat ground. Our eight-week running for weight loss features sprint interval workouts that call for repeated 30-second uphill runs. These should be hard efforts, but not so hard that you find yourself slowing down before you complete the final interval. While running melts away excess body fat, strength training burns additional calories and preserves muscle mass. This is important, because when you’re eating 300 to 500 fewer calories than your body uses daily, you are likely to lose muscle along with fat. However, if you supplement your running with a couple of full-body strength workouts each week, all of your weight loss will in fact be fat loss. Strength training may be performed at a gym or in your living room. Focus on bodyweight as well as weight-lifting exercises, such as lunges, squats, deadlifts, pushups, shoulder presses and planks. CLICK HERE FOR WOMEN’S RUNNING STRENGTH TRAINING WORKOUTS! 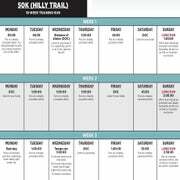 This eight-week training plan incorporates the three key workout types and adds an optional once-weekly easy run or cross-training session for those who are seeking faster results. The schedule is progressive, which means that the training load increases from week to week. The exceptions are weeks four and seven, when the training load is cut back to promote recovery. There’s no such thing as a one-size-fi ts-all plan, so feel free to adjust this one as necessary. If the runs you see here are longer than those you’re used to performing, dial the distance back a bit. On the other hand, if your runs are already longer than 45 minutes (the longest run in week one), then add a little time to some or all of the runs on the schedule. How many pounds can you expect to lose on this plan? That depends on many individual factors, including your diet and how close you are now to your optimal weight. But we can guarantee, you’ll be in better shape after week eight than you were before week one. Good luck and have fun! FAT-BURNING RUN: Run for the time indicated at a pace that is 65 percent of your maximum heart rate (if using a monitor) or a fi ve out of 10 on the perceived effort scale, i.e., a comfortable pace. STRENGTH TRAINING: Perform strength-training exercises, including squats, lunges, pushups, deadlifts, planks and overhead presses for the time indicated. SPRINT INTERVALS: Perform all intervals on a steep hill or a treadmill set to a 6- to 8-percent incline. Run 10 minutes at an easy pace to warm up. Sprint up the hill for 30 seconds at a very challenging effot. Recover by jogging down the hill (or on a 0-percent incline for two minutes). Complete as many sprints as indicated. Finish the workout with another 10 minutes of easy running. EASY RUN: Run at an easy pace for 20 to 45 minutes. REST: Take the day off from exercise. Walk or perform a gentle workout like yoga if you wish. Get even more weight loss tips and great training plans by subscribing to Women’s Running Magazine! Click here to check out our latest deal.